Elgar planned a trilogy of oratorios about the Apostles (which he never completed), devising his own libretto from various sources, biblical and other. The Apostles was first performed at the 1903 Birmingham Festival, with The Kingdom following three years later. While composing The Kingdom in 1905 Elgar underwent some spiritual crisis which shook his religious faith and he was also physically unwell. The music leaves an impression of lyrical tenderness and deep sadness. The Prelude is called ‘Jerusalem’, although it might equally have been called ‘St. Peter’, who is the crucial figure in the oratorio. It opens vigorously—allegro maestoso—with a combination of two themes which represent the Gospel and its Preachers. After this comes a brilliantly orchestrated version of the Apostles theme. Trumpets play a three-chord motif associated with Peter which is repeated six times, leading into a section in which music from The Apostles depicting Peter’s denial of Christ and his subsequent remorse (four muted horns) is recapitulated. As this quiet episode ends, the Apostles motif heralds a modulation into D flat for a new consolatory and aspiring melody on the strings (andante, dolce e solenne) which Elgar called the ‘New Faith’ theme. It has a tender, subsidiary theme and both are repeated by full orchestra. Two further new melodic fragments, the first being Elgar’s version of the antiphon O sacrum convivium, give way to yet another prayerful and devout theme. The composer himself provided the concert ending used here. 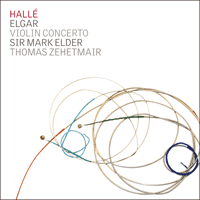 In the first years of the 20th century, the Austrian violinist Fritz Kreisler asked Elgar for a concerto. Elgar made some sketches in 1907 but laid them aside to write his first symphony. The score was eventually completed in August 1910 and the first performance was given in the Queen’s Hall, London, on 10 November that year, conducted by the composer. The work was enthusiastically received and soon repeated, with Kreisler playing it throughout Britain with either Elgar or Henry Wood as conductor. Elgar’s letters reveal that the concerto is closely linked with Mrs Alice Stuart Wortley, daughter of the artist Millais, and Elgar’s muse between 1907 and about 1920. He refers to several of the themes as ‘Windflower themes’—his intimate name for her was ‘Windflower’ (wild anemone)—and in his letters he refers to the concerto as ‘our own concerto’. But there are other candidates. The secret died with him, but the music is full of regret for what might or could have been. 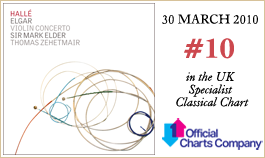 The first movement, Allegro, begins with a long orchestral tutti ranging through several keys—B minor, F sharp minor, G major and D major, for example, are all explored in this movement—and introducing at least six themes, or fragments of themes, all closely related. The first of them, the work’s motto-theme in a sense, opens the concerto in the dark colours of lower woodwind, horns and strings. It is with this theme, or part of it, that the soloist makes his dramatically prepared entry. After its excursion through several tonalities, the orchestra returns to the first subject: it plays the first two bars then the violin, nobilmente, on the G string, completes it. The soloist muses, expands and decorates this theme and then alights on G major to take over from the woodwind the first complete statement of the second subject. It has been foreshadowed, almost casually, by the full orchestra; now it is played most tenderly—semplice and pp are the dynamic markings. This is the principal ‘Windflower’ theme. Its intensity and passion grow but subside into a ppp dolcissimo as the first subject returns. The development section is a kind of free fantasia, with particularly powerful treatment of the ‘Windflower’ subject. It leads to a recapitulation of the soloist’s first entry. Once again the violin answers the orchestra and once again the principal subject is presented in a different melodic guise. The impassioned climaxes between the serene and cloistered opening and the tranquil ending of the Andante (in B flat) stress again the tragic force of Elgar’s inspiration. The beautiful first subject is played by the orchestra, the rests at the end of the second and fourth bars being bridged by chords on woodwind and horns. But the soloist never takes up this material as presented by the orchestra. instead entering with another theme, leaving the first subject as accompaniment on strings. It was this theme that Elgar later said he would like to be inscribed on his tombstone. The finale begins quietly with rapid and brilliant flourishes for the soloist introducing the vivacious march-like main theme, played by the orchestra and taken up forcefully by the soloist. This movement then becomes an elaborate vehicle for the violinist’s virtuosity, with themes from the first and second movements recalled in altered form. The concerto is remarkable for its long accompanied cadenza, perhaps Elgar’s most novel and beautiful instrumental invention. This is the epitome of the concerto, a review of the themes (particularly the ‘Windflower’ theme) in which the violin muses nostalgically on them, elaborates them and reveals their interrelationship. Finally the soloist recalls the opening theme of the concerto, slowly, expressively and nobilmente. As the past is buried, the exciting present returns and the concerto ends in coruscating fashion. Elgar’s setting for three soloists, chorus and orchestra of Cardinal Newman’s poem about a man’s journey after death was a relative failure at Birmingham in October 1900 because of a poor performance. But there were demands—particularly from the conductor Henry Wood—for extracts from it which could be performed as concert pieces in the manner of Wagner’s Prelude and Liebestod from Tristan und Isolde. Elgar’s solemn and elevating Prelude was an obvious choice for this treatment and, like Wagner, he then went to the end of the work and the point at which Gerontius’s guardian angel (mezzo-soprano) sings seraphically of how she will accompany him to the throne of God, bearing him ‘softly and gently’ in her arms. When he worked on this arrangement at the end of 1900, Elgar made the vocal part optional and he conducted it for orchestra only at Bradford on 16 February 1901. Four days later Wood conducted the first London performance (the first music by Elgar that he conducted) but included the vocal part, as on this recording. Elgar prévoyait de composer une trilogie d’oratorios sur les Apôtres (qu’il ne mena jamais à bien), confectionnant son livret à partir de différentes sources, bibliques et autres. Les Apôtres fut créé lors de l’édition 1903 du Festival de Birmingham, Le Royaume lui faisant suite trois ans plus tard. Alors qu’il était en train de composer Le Royaume en 1905, Elgar traversa une sorte de crise spirituelle qui ébranla sa foi religieuse, lui causant dans la foulée des problèmes de santé. Cette page laisse une impression de tendresse lyrique et de profonde tristesse. Le Prélude s’intitule «Jérusalem» , mais il aurait tout aussi bien pu se nommer «Saint-Pierre» , car celui-ci est la figure-clé de l’oratorio. Le morceau débute avec vigueur—allegro maestoso—, combinant deux thèmes qui représentent l’Évangile et ses Prédicateurs. Vient ensuite une version brillamment orchestrée du thème des Apôtres. Les trompettes jouent un motif de trois accords associé à Pierre qui est répété six fois, introduisant une section où sont récapitulées des pages des Apôtres décrivant le reniement du Christ par Pierre et les remords qu’il en éprouve (quatre cors avec sourdine). Lorsque ce paisible épisode s’achève, le motif des Apôtres annonce une modulation vers ré bémol pour une nouvelle mélodie consolatrice et pleine d’aspirations confiée aux cordes (andante, dolce e solenne) qu’Elgar appelait le thème de la «Foi nouvelle» . Elle présente un tendre thème subsidiaire et tous deux sont répétés par l’orchestre au complet. Deux nouveaux fragments mélodiques, le premier étant une version tirée par Elgar de l’antienne O sacrum convivium, laissent place à un dernier thème plein de ferveur et de dévotion. On doit la conclusion de concert employée ici au compositeur. Au cours des premières années du XXè siècle, le violoniste autrichien Fritz Kreisler demanda à Elgar de lui composer un concerto. Elgar fit quelques esquisses en 1907 mais les mit de côté pour écrire sa première symphonie. La partition finit par être achevée en août 1910 et la création fut donnée au Queen’s Hall de Londres, le 10 novembre de cette même année, sous la direction du compositeur. L’ouvrage reçut un accueil enthousiaste et ne tarda pas à être repris, Kreisler le jouant dans toute la Grande-Bretagne sous la baguette d’Elgar ou de Henry Wood. La correspondance du compositeur nous révèle que le concerto est associé de près à Mme Alice Stuart Wortley, la fille du peintre Millais, qui fut la muse d’Elgar entre 1907 et 1920 environ. Il fait allusion à plusieurs des thèmes de l’ouvrage en parlant des «thèmes de Windflower»—«Windflower» (anémone sauvage) étant le surnom qu’il donnait à la jeune femme dans l’intimité—et dans ses lettres, il cite le concerto comme étant «notre concerto à nous» . Toutefois, il y a d’autres candidates. Le secret s'éteignit avec lui, mais cette musique est pleine du regret de ce qui fut ou aurait pu être. Le premier mouvement, Allegro, débute par un long tutti orchestral qui parcourt plusieurs tonalités—si mineur, fa dièse mineur, sol majeur et ré majeur, par exemple, sont toutes explorées dans ce mouvement—et introduit au moins six thèmes, ou fragments de thèmes, tous étroitement liés. Le premier d’entre eux, qui est pour ainsi dire le thème-signature de l’ouvrage, ouvre le concerto sur les sombres couleurs des bois graves, des cors et des cordes. C’est avec ce thème, ou l’un de ses fragments, que le soliste fait sa théâtrale entrée, mûrement préparée. Après son excursion multi-tonale, l’orchestre revient au premier sujet: il joue les deux premières mesures, puis le violon, nobilmente, l’achève sur la corde de sol. Le soliste musarde, développe et orne ce thème, puis se pose sur sol majeur pour reprendre des bois la première énonciation complète du second sujet. Celui-ci a été annoncé, presque nonchalamment, par l’orchestre au complet; il est maintenant joué très tendrement—avec semplice et pp pour indications dynamiques. Il s’agit du principal «thème de Windflower» . Son intensité et sa passion vont croissant mais s’éteignent en un dolcissimo ppp lorsque le premier sujet reparaît. La section de développement est une sorte de fantaisie libre, avec un traitement particulièrement puissant du sujet «de Windflower». Elle mène à une récapitulation de la première entrée du soliste. Une fois encore, le violon répond à l’orchestre, et le sujet principal est à nouveau présenté sous une apparence mélodique différente. Les apogées passionnés encadrés par l’ouverture sereine et recluse et la paisible conclusion de l’Andante (en si bémol) soulignent une nouvelle fois la force tragique de l’inspiration d’Elgar. Le très beau premier sujet est joué par l’orchestre, les pauses de la fin des deuxième et quatrième mesures étant comblées par des accords des bois et des cors. Néanmoins, le soliste ne reprend jamais ce matériau tel qu’il est présenté par l’orchestre, au lieu de quoi il entre avec un nouveau thème, laissant les cordes utiliser le premier sujet comme accompagnement. C’est ce thème dont Elgar déclara plus tard qu’il voudrait le voir inscrit sur sa tombe. Le finale démarre sans bruit avec des interventions rapides et brillantes du violon qui introduisent le vif thème principal aux allures de marche, joué par l’orchestre et vigoureusement repris par le soliste. Ce mouvement devient alors une vitrine recherchée pour la virtuosité du violoniste, avec des thèmes des premier et second mouvements rappelés sous des formes modifiées. L’un des traits remarquables de ce concerto est sa longue cadence accompagnée, sans doute l’invention instrumentale la plus belle et novatrice d’Elgar. Elle résume tout le concerto, reprenant les thèmes (et notamment le thème «de Windflower» ) pour permettre au violon de s’y attarder avec nostalgie, de les développer et de révéler les liens qui les unissent. Finalement, le soliste rappelle le thème d’ouverture du concerto, lentement, éloquemment et nobilmente. Tandis que le passé est enterré, les joies présentes reviennent et le concerto trouve son étincelante conclusion. La mise en musique par Elgar pour trois solistes, chœur et orchestre du poème du cardinal Newman sur le voyage d’un homme après sa mort essuya un échec relatif à Birmingham en octobre 1900 à cause d’une exécution médiocre. Mais plusieurs personnes—et en particulier le chef d’orchestre Henry Wood—réclamèrent des extraits de l’ouvrage pouvant être donnés en guise de morceaux de concert à la manière du Prélude et de la Liebestod de Tristan et Isolde de Wagner. Le Prélude solennel et édifiant d’Elgar constituait un choix évident pour un tel traitement, et à l’instar de Wagner, le compositeur choisit la fin de son ouvrage, le moment où l’ange gardien de Géronte (un mezzo-soprano), dans un chant séraphique, lui dit qu’il va l’accompagner jusqu’au trône de Dieu en le portant «doucement et tendrement» dans ses bras. Lorsqu’il travailla à cet arrangement fin 1900, Elgar rendit sa partie vocale facultative et le dirigea lui-même avec orchestre seul à Bradford le 16 février 1901. Quatre jours plus tard, Wood dirigeait la première exécution londonienne (c’était aussi la première fois qu’il dirigeait une œuvre d’Elgar), mais avec la partie vocale incluse, comme sur cet enregistrement. Elgar plante eine (nie vollendete) Trilogie von Oratorien über die Apostel, für die er seine eigenen Libretti nach diversen biblischen und anderen Quellen entwarf. The Apostles wurde 1903 beim Birmingham Festival uraufgeführt, und The Kingdom folgte drei Jahre später. Während er 1905 an The Kingdom arbeitete, machte Elgar eine spirituelle Krise durch, die ihn an seinem religiösen Glauben zweifeln ließ, und es ging ihm auch körperlich schlecht. Die Musik hinterlässt den Eindruck lyrischer Zärtlichkeit und tiefer Traurigkeit. Das Präludium trägt den Titel “Jerusalem”, obwohl es genauso gut “Sankt Peter” heißen könnte, denn der ist die zentrale Gestalt des Oratoriums. Es beginnt voller Leidenschaft—allegro maestoso—mit einer Kombination zweier Themen, die das Evangelium und seine Prediger darstellen. Dann folgt eine großartig orchestrierte Version des Apostel-Themas. Trompeten spielen ein mit Peter verbundenes Motiv aus drei Akkorden, das dreimal wiederholt wird und in einen Abschnitt übergeht, in dem Musik aus The Apostles rekapituliert wird, die von Peters Verleugnung Christi und seiner nachfolgenden Reue handelt (vier gedämpfte Hörner). Wenn diese leise Episode endet, verkündet das Apostel-Motiv eine Modulation nach Des für eine neue trostvolle und aufstrebende Streichermelodie (andante, dolce e solenne), die Elgar als Thema vom “neuen Glauben” (New Faith) bezeichnete. Hinzu gesellt sich ein zartes Seitenthema, und beide werden vom vollen Orchester wiederholt. Zwei weitere neue Melodiefragmente, bei deren erstem es sich um Elgars Version des Antiphons O sacrum convivium handelt, weichen einem weiteren andächtigen und frommen Thema. Der Komponist selbst fügte den Konzertschluss hinzu, der bei der vorliegenden Aufnahme zum Einsatz kommt. In den ersten Jahren des 20. Jahrhunderts bat der österreichische Geiger Fritz Kreisler Elgar um ein Konzert. Elgar machte 1907 einige Entwürfe, legte sie aber beiseite, um seine erste Sinfonie zu komponieren. Die Partitur wurde schließlich im August 1910 fertig, und die Uraufführung fand am 10. November jenes Jahres in der Londoner Queen’s Hall unter der Leitung des Komponisten statt. Das Werk fand begeisterte Zustimmung und wurde bald wiederholt, wobei Kreisler es in ganz Großbritannien spielte, mit Elgar oder Henry Wood als Dirigenten. Das Werk ist offiziell Kreisler gewidmet, aber eine verborgene Widmung wirft ein weiteres Elgarsches Rätsel auf. Gegenüber der ersten Partiturseite schrieb Elgar ein Zitat (aus Alain-René Lesages Roman Gil Blas) auf Spanisch: “Aquí está encerrada el alma de …” (“Hier liegt begraben die Seele von …”). Die fünf Punkte waren absichtlich eingefügt. Elgar gestand, dass die “Seele” weiblich war, weigerte sich jedoch, mehr dazu zu sagen, außer dass “darin eine Menge encerrada [begraben] ist—mehr, als die Öffentlichkeit je erfahren wird!” Elgars Briefe lassen erkennen, dass das Konzert eng mit Mrs. Alice Stuart Wortley, der Tochter des Malers John Everett Millais and Elgars Muse zwischen 1907 und etwa 1920, verbunden ist. Er bezeichnet mehrere der Themen als “Windblütenthemen”—sein intimer Beiname für sie war “Windflower” (Windblüte oder Buschwindröschen, eine wild wachsene Anemone)—und in seinen Briefen nennt er das Werk “unser eigenes Konzert”. Doch es gibt noch andere Anwärterinnen. Er nahm das Geheimnis mit ins Grab, doch die Musik ist voller Bedauern um das, was hätte sein können. Der erste Satz, Allegro, beginnt mit einem langen Orchestertutti, das durch mehrere Tonarten schweift – h-Moll, fis-Moll, G-Dur und D-Dur werden beispielsweise in diesem Satz erkundet—und mindestens sechs Themen bzw. Themenfragmente einführt, die alle eng miteinander verwandt sind. Das erste davon, gewissermaßen das Leitthema des Werks, eröffnet das Konzert in den dunklen Klangfarben der tiefen Holzbläser, Hörner und Streicher. Mit diesem Thema, oder zumindest mit einem Teil davon, hat der Solist seinen dramatisch vorbereiteten Einsatz. Nach seinem Ausflug durch mehrere Tonarten kehrt das Orchester zum Hauptthema zurück: Es spielt die ersten zwei Takte, dann vollendet es die Geige nobilmente auf der G-Saite. Der Solist sinniert über dieses Thema, erweitert und verziert es, dann landet er in G-Dur, um von den Holzbläsern die erste vollständige Darlegung des zweiten Themas zu übernehmen. Es ist vom vollen Orchester fast beiläufig angedeutet worden; nun wird es ausgesprochen zärtlich gespielt—die Dynamikangaben lauten semplice und pp. Dies ist im Wesentlichen das “Windblüten”-Thema. Intensität und Leidenschaft wachsen, sinken aber nach ppp dolcissimo herab, wenn das Hauptthema wiederkehrt. Die Durchführung ist eine Art freier Fantasia mit besonders eindringlicher Behandlung des “Windblüten”-Themas. Sie geht über in eine Reprise des ersten Solisteneinsatzes. Die Geige antwortet wiederum dem Orchester, und erneut wird das Hauptthema in abgewandelter melodischer Form dargeboten. Die leidenschaftlichen Höhepunkte zwischen der gelassenen, klösterlichen Eröffnung und dem friedlichen Schluss des Andante (in B-Dur) betonen erneut die überzeugende Tragik von Elgars Inspiration. Das wunderschöne Hauptthema wird vom Orchester dargeboten, wobei die Pausen am Ende des zweiten und vierten Takts von Akkorden der Holzbläser und Hörner überbrückt werden. Doch der Solist übernimmt niemals dieses Material in der vom Orchester vorgestellten Form, sondern setzt mit einem anderen Thema ein und überlässt das erste Motiv den Streichern als Begleitung. Dies war das Thema, von dem Elgar später sagte, er hätte es gern auf seinem Grabstein verewigt. Das Finale beginnt leise mit schnellen, brillanten Ausschmückungen des Solisten, der ein munteres Hauptthema in der Art eines Marsches einführt, vom Orchester gespielt und dann kraftvoll vom Solisten übernommen. Der Satz wird dann ein kunstvoll ausgefeiltes Vehikel für die Virtuosität des Solisten, wobei Themen aus dem ersten und zweiten Satz in abgewandelter Form in Erinnerung gerufen werden. Bemerkenswert an dem Konzert ist die lange begleitete Kadenz, womöglich Elgars neuartigste und schönste instrumentale Eingebung. Dies ist der reinste Inbegriff des Konzerts, mit einer Rückschau auf die Themen (insbesondere auf das “Windblüten”-Thema), worin die Geige nostalgisch über sie nachsinnt, sie ausführt und ihre Verbindungen zueinander offenbart. Abschließend erinnert der Solist langsam, ausdrucksvoll und nobilmente an das Eröffnungsthema des Konzerts. Die Vergangenheit wird begraben, die aufregende Gegenwart kehrt wieder, und das Konzert endet voller Glanz. Elgars Vertonung (für drei Solisten, Chor und Orchester) von Kardinal John Henry Newmans Gedicht über den Weg eines Mannes nach seinem Tod war bei seiner Uraufführung in Birmingham im Oktober 1900 wegen der schlechten Darbietung ein relativer Misserfolg. Aber es gab Forderungen—insbesondere von dem Dirigenten Henry Wood—nach Auszügen, die man als Konzertstücke in der Art von Wagners Vorspiel und Liebestod aus Tristan und Isolde aufführen konnte. Elgars feierliches und erhebendes Vorspiel bot sich dafür geradezu an, und ähnlich wie Wagner wandte er sich dann dem Ende des Werks zu, jenem Punkt, an dem der Schutzengel des Gerontius (Mezzossopran) seraphisch davon singt, wie er ihn zum Thron Gottes geleiten wird, ihn “sanft und behutsam” in den Armen wiegend. Als Elgar gegen Ende des Jahres 1900 an diesem Arrangement arbeitete, machte er die Gesangsstimme fakultativ und dirigierte das Werk am 16. Februar 1901 in Bradford für Orchester allein. Vier Tage spatter leitete Wood die erste Londoner Aufführung (das erste Mal, dass er Elgars Musik dirigierte), doch fügte er, wie auch die vorliegende Einspielung, die Gesangsstimme ein.